I recently bought "The Homemade Life" by Molly Wizenberg, the author of the blog Orangette. I was a big fan of her blog – simple photos, interesting compositions and witty writing. The book was no disappointment. Her recipes are woven throughout memories of her father and family. 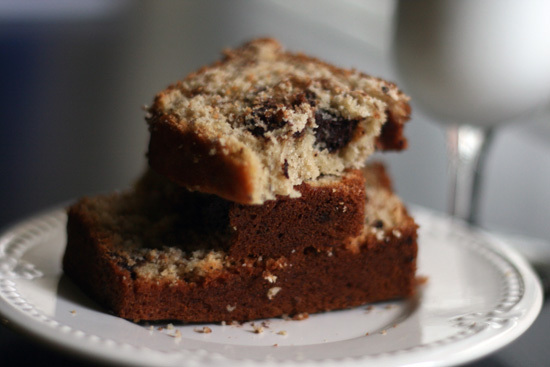 've had banana bread before, but never like this. It is so moist, delicate and it doesn't scream banana, it is mild and delicious. This particular recipe originally included ginger, but I'm not a huge fan so I left it out. This was really easy, even for me, and lasts up to 5 days, covered in aluminum foil on the counter. It is especially yummy heated up in the toaster for breakfast. If you try it with ginger, let me know how it goes! Enjoy! 1 Preheat oven to 350 degrees. Grease a standard loaf pan (9x5 in) with cooking spray. 2 Melt butter in the microwave. Set aside. 3 In a large bowl, whisk the flour, sugar, baking soda, and salt. Add the chocolate and whisk well to combine. 4 In a separate bowl, lightly beat the the eggs. Add the mashed banana, yogurt, melted butter, and vanilla. Stir to mix well. 5 Pour the banana mixture into the dry ingredients and stir gently. Do not overmix, but there should be no unincorporated flour. 6 Pour the batter into the prepared pan and smooth the top. 7 Bake 50 minutes to an hour until the loaf is a deep shade of golden brown. Cool the loaf for 5 minutes. Let it cool completely before slicing. Note: Molly says this bread freezes very well, wrap it in plastic wrap and then again in aluminum foil. Banana bread is my favorite and I've never had chocolate in it. YUM Thanks for this recipe. 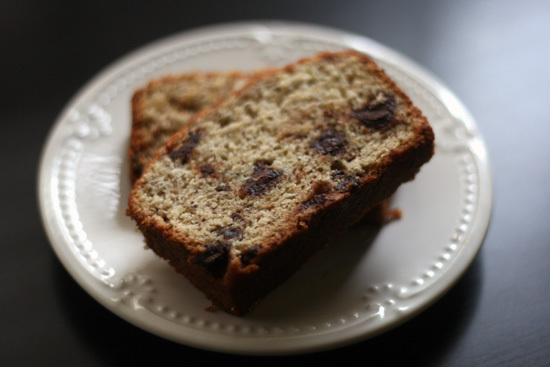 chocolates makes this banana bread extra special. Looks wonderful with the chocolate. I've been wondering how her book was. I never really got onto the banana bread with chocolate thing... But now I realize it's delicious with a slick of choc ganache! MMM, double chocolate goodness. think bananas and chocolate go hand in hand!! !